Studies suggest that spending time with your partner and another couple is an easy way to improve your relationship. Couples tend to enjoy the time they spend together with friends even more than they enjoy spending time alone together. That’s possibly because you can see those friends admiring your partner the way you once admired them (or still do). Earlier this month, historian Stephanie Coontz published an op-ed in The New York Times about improving your marriage by acting like a single person. This wasn’t something I’d heard before. In fact, it was antithetical to everything I’d heard before, about “date nights” and savouring QT with your QT (sorry). As evidence, Coontz points to a 2014 study published in the journal Personal Relationships. For that study, researchers recruited about 150 couples and had half interact with another couple they’d never met before. Half the couples in both groups engaged in small talk; the other half asked each other deeper questions. Results showed that couples who interacted with another couple and asked each other deep questions showed the greatest increase in passionate love for their own partners at the end of the experiment. The 2014 study extends the findings of a 2010 study, also published in the journal Personal Relationships. That study, which was smaller, found that couples who had meaningful conversations with other couples felt closer to their own partners afterward. Indeed, the 2014 study found that it wasn’t self-disclosure (as in, revealing personal details to another couple) itself that predicted the increase in passionate love within couples. Instead, it was mostly the way the other couple reacted to those disclosures. Ultimately, this research doesn’t suggest you should never spend time alone with your partner. Especially in the early stages of your relationship – i.e. when you haven’t yet heard the same stories 100 times – it makes sense to get to know your partner in a more private setting. 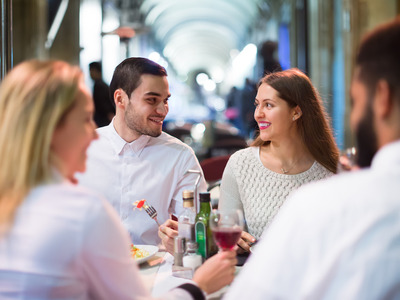 But once your relationship has progressed to a more serious phase, double dating can be a useful way to both stave off boredom and reignite your passion for each other.